Yes, positioning for crew isn't as obvious as for cast. Not much I can do about theme inconsistence, I'm afraid. Except possibly remove the theme. 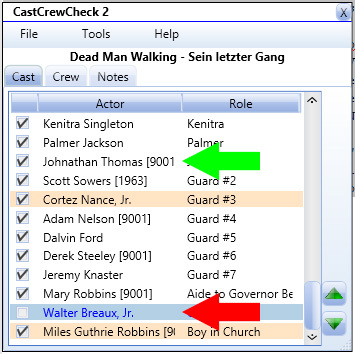 I noticed that the logic for moving checked/unchecked cast was flawed, so I fixed that. I realized that the themeing problem was because the up button was a RepeatButton rather than a standard Button. But since a new entry can now be moved up by just checking it, the repeat action was not necessary, so I changed the button back to standard, thus making the theme work ok.
Also changed to make sure that newly added cast was scrolled into view. 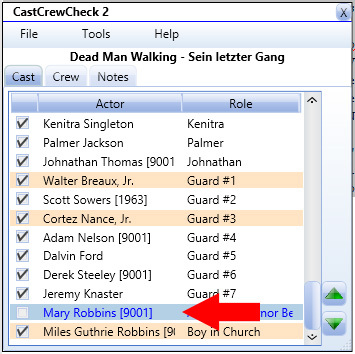 I was considering making newly added cast automatically checked, and thus moved up to their "proper" place, but I wasn't sure that it would always be desireable. Any thoughts on this? Hm, I'm re-positioning crew all the time - so it would be great, if at least the row I check will get selected automatically. Is that 2.4.1? Because that looks just like the problem I fixed (or at least tried to fix...). it would be great, if at least the row I check will get selected automatically. It gets selected when I try it. be aware that I was talking about crew! Crap! I think I may need stronger reading glasses! Well, you know what they say: If at first you don't succeed, blame someone (or something) else"
So, with 2.4.3 that makes 4 releases today. 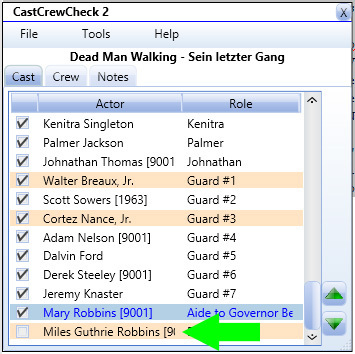 Setting up a custom role. 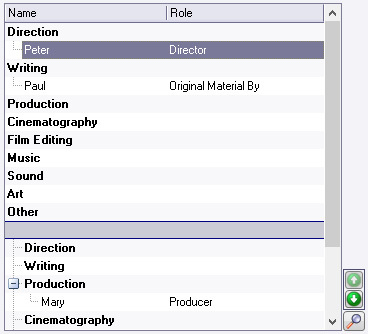 Custom roles are working now. This is a real problem, as you can't automatically know, which CreditType the Divider belongs. I guess you will have to add a drop-down menu to the Add Divider dialog, where you can set this manually. Well, I screwed up the end divider. But that's fixed now, in 2.4.5. I have to confess that I didn't pay much attention to group dividers in the crew section. 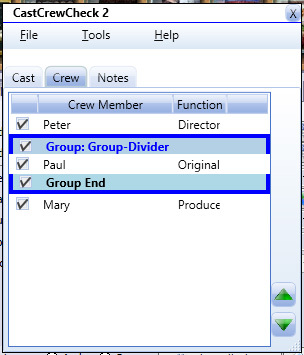 If I had, I would have realized from the start that they were different from group dividers in cast. 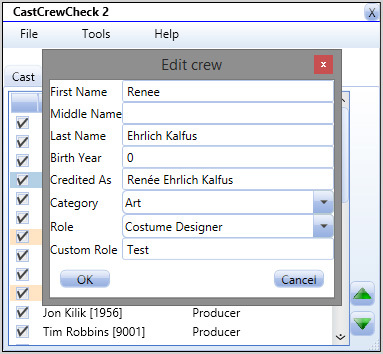 The problem is that adding crew dividers depend on the groupings within the crew section. You can't just add a divider and then move it to the right place. 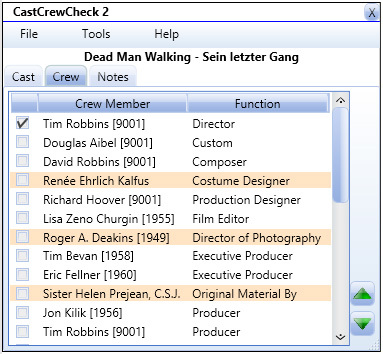 CastCrewCheck doesn't keep track of the groupings. 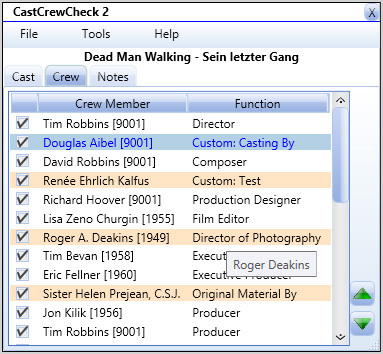 Unlike in Profiler, you can move crew entries anywhere, and Profiler will group them into the correct groups. Keeping the groups together would require a major rewrite of the crew section of the program. I suspect you will not like the solution, but dividers are now not supported in the crew section. You'll have to add them after you have pasted the crew into Profiler. Sorry. Will this change? Well, right now I don't feel that the effort involved is justified. But who knows, I have been known to tackle things just because they offer a challenge. But I doubt it will happen anytime really soon. 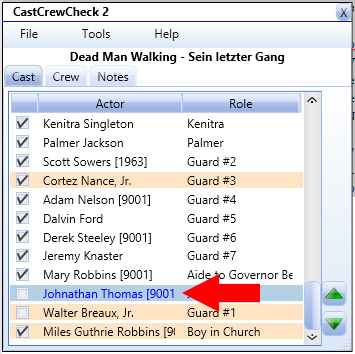 I hope this won't stop you from finding CastCrewCheck useful. 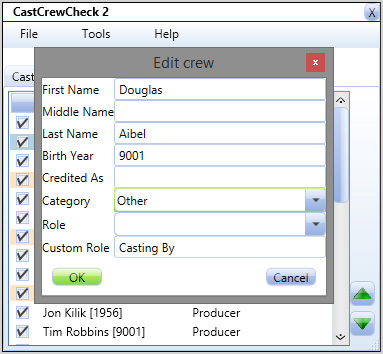 The problem is that adding crew dividers depend on the groupings within the crew section. You can't just add a divider and then move it to the right place. 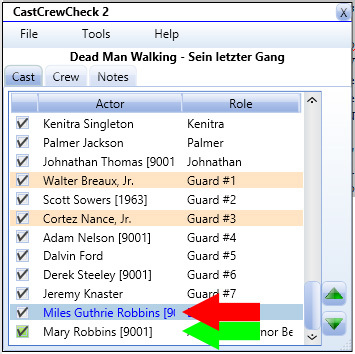 CastCrewCheck doesn't keep track of the groupings. Whenever I add a group, I already know which section it belongs to and can add it myself. 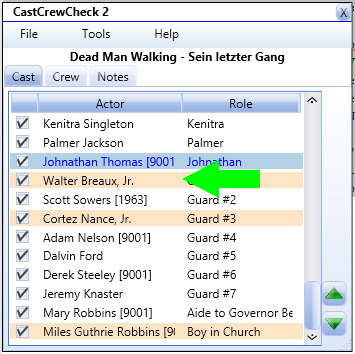 This way CastCrewCheck doesn't have to keep track of these groupings, the user himself has to. Hm, yes I suppose something like that could be doable. Why do you have to put ideas into my head...? Right now I'm in the middle of the original Quatermass and the Pit, though. The BBC TV show, that is.